Greenleaf Book Group Press, 9781626343719, 344pp. As a private banker working for the largest bank in the world, UBS, Bradley Birkenfeld was an expert in Switzerland's shell-game of offshore companies and secret numbered accounts. He wined and dined ultrawealthy clients whose millions of dollars were hidden away from business partners, spouses, and tax authorities. As his client list grew, Birkenfeld lived a life of money, fast cars, and beautiful women, but when he discovered that UBS was planning to betray him, he blew the whistle to the US Government. ​The Department of Justice scorned Birkenfeld's unprecedented whistle-blowing and attempted to silence him with a conspiracy charge. Yet Birkenfeld would not be intimidated. He took his secrets to the US Senate, the Securities and Exchange Commission, and the Internal Revenue Service, where he prevailed. His bombshell revelations helped the US Treasury recover over $15 billion (and counting) in back taxes, fines, and penalties from American tax cheats. But Birkenfeld was shocked to discover that at the same time he was cooperating with the US Government, the Department of Justice was still doggedly pursuing him. He was arrested and served thirty months in federal prison. When he emerged, the Internal Revenue Service gave him a whistle-blower award for $104 million, the largest such reward in history. 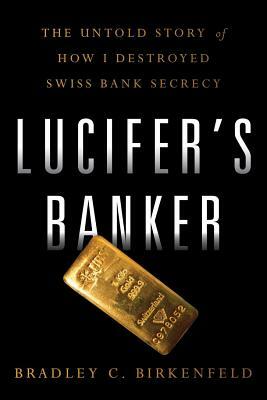 A page-turning real-life thriller, Lucifer's Banker is a fascinating behind-the-scenes look at the secret Swiss high-net worth banking industry and a harrowing account of our government's justice system. Readers will follow Birkenfeld and share his outrage with the incompetence and possible corruption at the Department of Justice, and they will cheer him on as he "hammers" one of the most well-known and powerful banks in the world. Bradley C. Birkenfeld is a retired financial industry professional renowned as the most significant whistle-blower in history. He is dedicated to supporting whistle-blower initiatives exposing and eliminating fraud. As a result of Brad's historic actions, the risks and costs to financial institutions that support clients' tax evasion, fraud, corruption, and terrorist activities have increased dramatically. Birkenfeld holds a BS in Economics from Norwich University in Vermont and an International MBA from the American Graduate School of Business in Switzerland. A lifelong fan of the Boston Bruins, Brad works with the team to help disadvantaged children, along with other philanthropic endeavors.